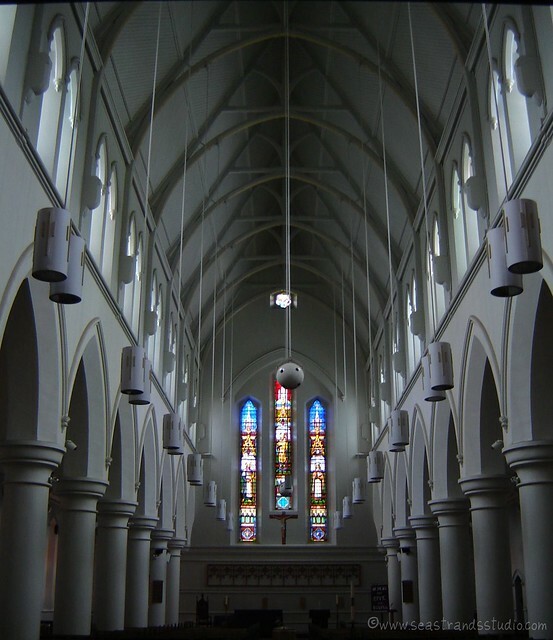 Orderly columns at St. Patrick's Church, St. John's, Newfoundland (Canada). Hand-held shot taken six years ago. ISO 80, with a shutter speed of 1/13 of a second (that's slow) with my old Sony DSC-S60. On days when I haven’t had enough sleep, I tend to try to pare life down to the essentials. That’s not going to be possible today, so the results of last night’s insomnia will simply have to be shoved aside, hopefully without too many consequences of any severity. Today I am hoping for order amid chaos, systematic progression amid a deluge of work, physical exhaustion through exercise so that my body and min are in sync, and oblivion at the end.